When I shared the story of the Bremen Town Musicians the other day, I included some pictures I took of the characters in shadow puppets. They are really easy to make, and I've got some templates and simple instructions so that you can make them too! 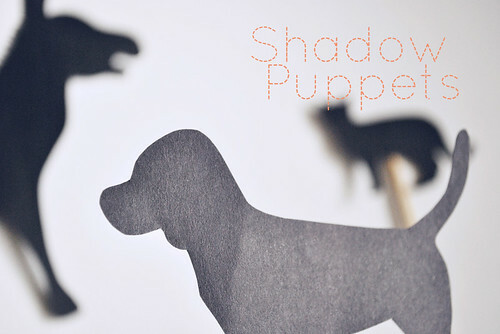 Download the PDF to make your own shadow puppets! Oh, and I wanted to add that making simple, non-moving shadow puppets of any kind is as easy as this: Find a photo with a strong shape or silhouette. Trace around it, and cut from black paper. Now you can make do a puppet show of just about anything! For a lovely look at more complex shadow puppets, specifically those for use in film, be sure to check out Annekata's recent post. So charming! So cute. I love your blog! That fairy tale is certainly one of the more unusual ones. The shadow puppets are great! Your blog is so adorable! I can't wait to see what you post next. Thanks so much for these, I'll be linking! We saw the Musicians of Bremmen at our local playhouse over Christmas. It was amazing the way they captured those animals!